"No news is good news" - we said that back in July and it is still true. C/2013 A1 (Siding Spring) continues to trend very close to the predict JPL curve, which is great news for the various spacecraft at Mars who are trying to plan for the encounter. 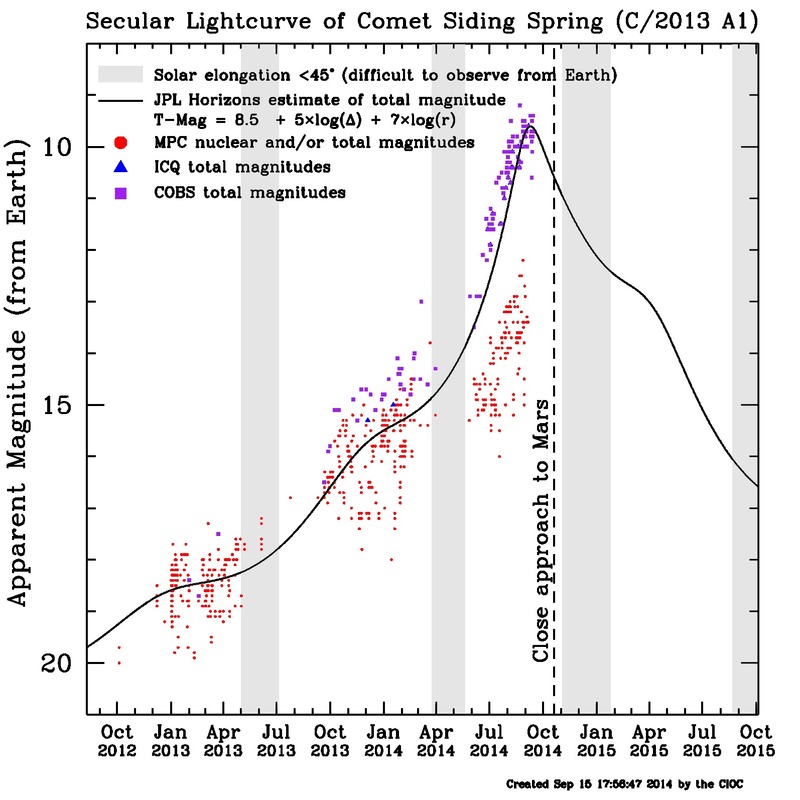 An interesting feature of the lightcurve is that due to the respective geometries of Earth, Mars, and Siding Spring, the comet is expected to get fainter as viewed from Earth even as it gets much brighter over the next month as seen from Mars. This is because it is now moving further away from Earth faster than it is approaching the Sun (and getting intrinsically brighter). From Mars' perspective it will continue to get closer to both Mars and the Sun until the big day (October 19), so it still has a lot of brightening left to do! If you've been hoping to see Siding Spring at its brightest with your own eye, contact your local astronomy club ASAP (noting that it is very far south so depending on where you are in the northern hemisphere it is currently impossible to see). However, if you're hoping to see some exciting images of the comet up close, sit back and relax...the Mars fleet will take care of that in just over a month.